We need to seriously re-assess the threat of inflation. Anytime a particular point of view reaches mass hysteria, you HAVE to be willing to look at it from a different perspective. Today, inflationary fears are beginning to reach that point. The words “Weimar” and “Zimbabwe” are thrown around regularly. Hyperinflation is becoming a serious point of discussion even amongst people who rarely focus on financial markets. When a crook of Liddy’s caliber appears as a spokesperson warning you not to trust the government and to diversify away from the dollar… then you know things are beginning to get out of control. It would be one thing if only a small handful or professional investors were warning about this (as was the case with the housing collapse and financial crisis). But inflation concerns are now common amongst even non-investors. Whenever everyone begins to think the same thing, you HAVE to question it, regardless of whether or not you personally believe it too. You never, and I repeat, NEVER make money by investing alongside the mob. So if the mob is screaming “inflation,” you have to be willing to re-consider the facts. It’s quite possible the mob is wrong (it usually is). Please understand, I write this with the utmost humility. I myself have brayed about inflation in previous months. But this current inflation mania is beyond anything I could have predicted. For certain, all fiat currencies fail. And at some point inflation will take hold and the world’s central banks will need to impose some kind of backing (most likely gold) to the world’s reserve currency. However, this may be several years down the road. It could potentially even be a decade down the road. No one really knows when it will happen. But one thing I DO know is that if I hear people talking about inflation in coffee shops (just as they were talking about Tech stocks in 1998 or housing prices in 2005) then it’s quite possible they’re wrong (at least in terms of the urgency of the matter). The primary belief driving the inflation trade is the idea that the Fed’s money printing will damage the dollar irrevocably. 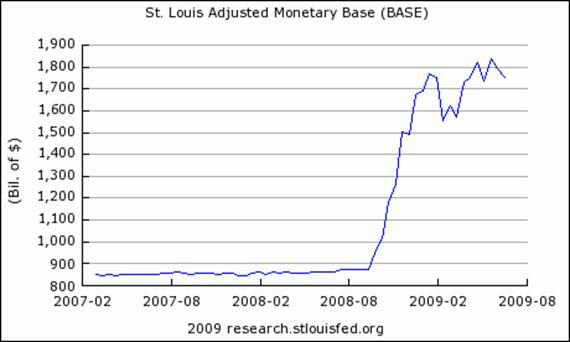 The below chart showing the US monetary base is often cited by inflationists (myself included) as evidence for this. As you can see, the Fed has more than doubled the US monetary base in the last year, pumping some $900 billion into the financial system. Inflationists are also quick to point out that the monetary base doesn’t account for the $13 trillion the Fed (and Treasury) have put into the system via various lending windows and off balance sheet arrangements. These lending/ printing efforts are seen as further evidence that the US is heading for massive inflation in the near future. Aside from the current money printing, there are also looming deficit and liabilities issues to be dealt with. All told the US has $11+ trillion in debt on its balance sheet. When you throw in future Medicare and Social Security expenses, our future liabilities explode to $65 trillion. Inflationists believe that the Fed will have to inflate these debts away, because the public would not stand for a default or rolling back of these programs. This last point is quite arguable however, since the hyperinflation used to inflate these debts away wouldn’t exactly thrill voters either. These, as far as I’ve seen, are the central arguments for coming inflation. Drawing from these ideas, inflationists believe that the dollar will soon roll over pushing commodities (especially gold) through the roof. This is a staggering, and I mean STAGGERING amount of money being thrown around. 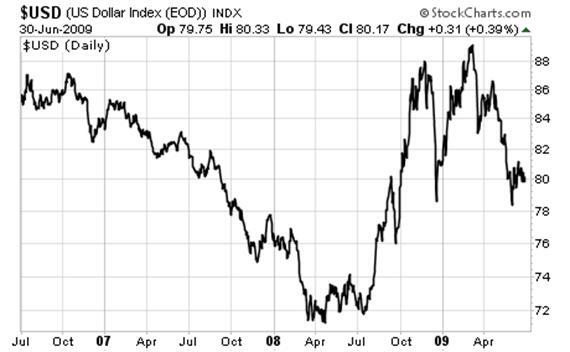 And yet, the dollar today is actually a full 11% HIGHER than it was in July 2008. In fact, it’s trading higher than it was BEFORE Bear Stearns went under!!! substantial funds to battling the crisis). the coffee shop crowd) is worried about inflation. To be blunt, either the market has lost any ability to discount the future what-so-ever, or the inflation story is not actually as simple as inflationists have claimed (money printing= inflation). I’m inclined to believe the latter, as indeed, nothing is ever quite what it seems or as simple as people make out. higher.” Clearly, the market is trying to tell us something different. I’ll detail what in my next essay. In the meantime, I’ve put together a FREE Special Report detailing when the next round of the financial crisis will hit and how to profit from the coming collapse in stocks. All in all it contains three investment opportunities that will soar when the bottom falls out in the financial markets. Looking at this week’s action it could happen sooner than later! Swing by www.gainspainscapital.com and claim your FREE copy of Financial Crisis Round Two Survival Kit today! PS. I’ve put together a FREE special report detailing how to play the coming agriculture boom as well as other inflation hedges that can protect you portfolio from the Fed’s money printing. You can pick up a FREE copy at: www.gainspainscapital.com.